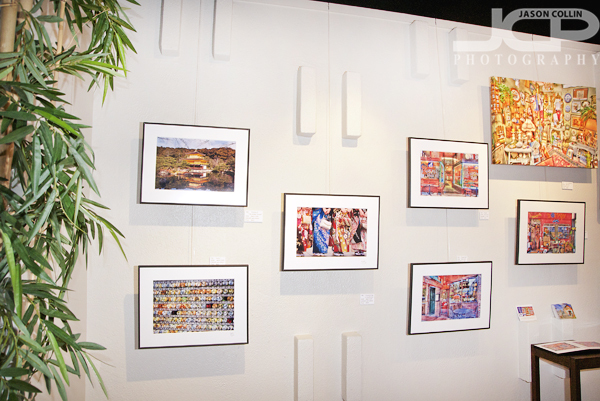 My three photographs are on the left, all from my time in JapanTonight was the opening of the f8 Consortium's "New Vision's" photography exhibition at the Menaul Fine Art gallery. This was the third time in six months my photographs have been featured in an exhibition in Florida (1st solo, 2nd), and the second time that all the photographs were from my Japan collection. A very respectable crowd turned out to see over nine different photographers' works ranging from HDR to digital art to sequential photography. My photographs were not the only ones from abroad as Europe was represented as well. I actually enjoyed talking to several people about the stories behind my shots, especially of "Coming of Age in Vivid Kimonos," one of my top five photographs from 2009. I finally got to meet Brenda Knoll in person also, as well as her husband. We had been Internet friends for awhile. I cannot take any credit for this exhibition's great opening. All that goes to other f8 members like Bob Kroll, Scott Menaul, Marc Norton, Patti Krumeich and all the others here. Thank you everyone. And thank you to everyone that came out to see our photographs and helped support local artists.